Following the discovery of a two headed turtle in Great Britain, President Bush has spoken out against Gay Marriages once again, claiming that they are to blame for the sudden increase in multiheaded animals making the headlines in the news. The President immediately assigned a task force to analyse the data, and to come up with strategies to prevent the existence of multiheaded creatures happening again. The scientists immediately analysed the data from the two cases to make the headlines in 2004 and discovered they have both taken place in Great Britain. After a phone call with the President, Prime Minister Tony Blair made a televised announcement to the nation, urging Britons to stand �shoulder to shoulder� with America. He explained that it was impossible for two headed creatures to do this properly as they only had one shoulder per head. As for creatures with three heads or more Mr Blair explained he couldn�t get his head around the logistics of head-shoulder ownership in those cases. 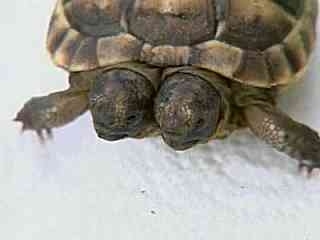 Critics of Mr Bush claim that 2 headed turtles are not uncommon in nature, it is just they rarely live longer than a year and before the advent of 24 hour news channels and the Internet they rarely made the news because there was normally more important things to broadcast � such as Vietnam and the death of Princess Diana. 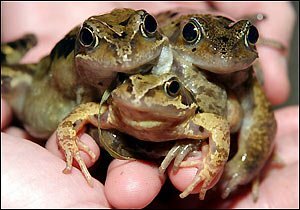 The Three Headed Frog. For the French, a meal in itself. 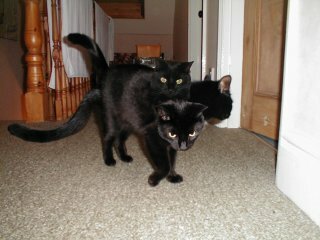 Scientists have explained it could be sometime before three headed pets are a common feature in petshops.